Jared "Cappie" Capp mixes clay that he will spread on the three straw bale walls of this home he is building in Spearfish. Capp said it's the first home in the state that is code approved to bear a load on straw bales. A cable is used to pre-tension the bales. "That was part of the code-approval process. That was a design that an engineer and I came up with to basically squish the bales before we put the roof on," said Capp. 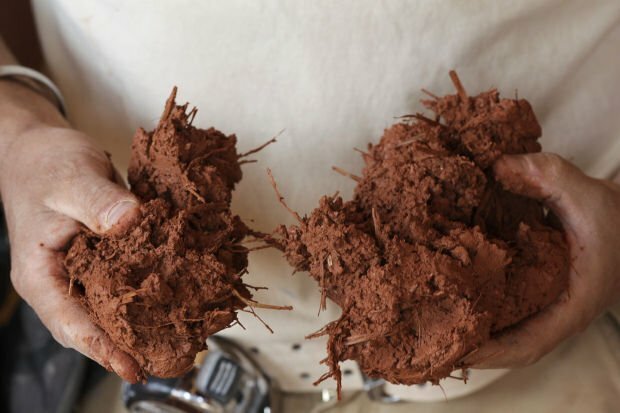 Jared Capp holds a clump of cob, which is a mixture of red clay, sand and straw. The material has been used for hundreds of years to build structures. When it dries, it becomes hard, similar to plaster. Capp built a heater wall and lined the interior and exterior straw bale walls with cob. Holly and Jared Capp are pictured inside of a home they are building on their property. Behind them is a rocket mass heater, built from cob and extremely energy efficient. The heater will use about one-quarter of a cord of wood per year to heat the 650-square-foot home, Jared Capp said. Jared Capp explains how he designed this sustainable home as he spreads cob on the walls, which are constructed with straw bales. When the material is finished, it will resemble polished leather, he said. A tree is designed into the rocket mass heater, which will provide efficient heat to the sustainable home Jared and Holly Capp are building on their property. Wood infrastructure frames Jared Capp as he spreads red clay on the walls of a sustainable home he is building. The home will have a laundry room, full bathroom, bedroom, kitchen and living room. Capp installed a gray-water system, which is the first in the country that is code approved to use water from the kitchen sink. A grease trap and particulate filter make the design possible, he said. Many straw bale homes have a "truth window," which reveals what is behind the walls once they are finished, Jared Capp said. "It’s just kind of a fun little thing." SPEARFISH | Jared “Cappie” Capp of Spearfish has heard every "Three Little Pigs" joke there is. It’s a natural reaction when people hear he is building a house made out of straw. Capp and his wife, Holly, started planning the project almost five years ago. 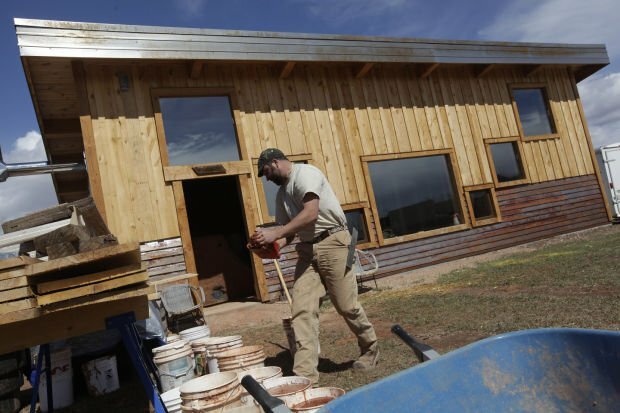 They wanted to build an energy-efficient, natural, code-approved, handicapped-accessible, environmentally responsible, sustainable building that was completely off the grid on their 3-acre farm, which is in the Spearfish city limits. The modest, one-bedroom, 650-square-foot home has three exterior walls constructed with straw bales, a front wall made out of wood and a steel roof. The construction is a simple yet labor-intensive process. The straw bale walls are covered in several layers of cob, a mixture of red clay, sand and straw. It makes the house energy efficient, practically fire proof and long lasting. Inside, it’s quiet, cool and still, similar to a basement. “It’s so different than a normal house in the way it moves and breathes,” Capp said. The house is heated with a rocket mass heater, which will use only a quarter of a cord of wood each year. It's 30 feet of stovepipe encased in a cob wall, which acts like a thermal battery, absorbing and sustaining heat. The house faces the south and will use solar panels to make electricity, with batteries under the raised living room floor. The panels also will provide shade in the summer as part of a passive solar design system. The straw bale construction was something that the city of Spearfish hadn't dealt with before; it didn’t fit within the standard residential building code, according to Tom Paisley, a building official with Spearfish's Building and Development Department. Part of being off the grid meant not connecting to the city-owned sanitary system. The Capp brothers included plans for a commercial self-contained compostable toilet to handle “black water” (feces) waste, which fit the under the building code as another alternative building method. They designed a “gray-water” system that would allow all the "waste" water from the kitchen sink, washing machine, shower and other sinks to be recycled in to the ground, rather than being flushed down the sewer. That required a change to an ordinance and approval from the city and the South Dakota Department of Environment and Natural Resources. “Existing ordinance allowed for either septic tank or sewer for black and gray water. Through building code, he could do the variance for the black water. I had to create an amendment to the ordinance to allow the gray-water system,” said Cheryl Johnson, the public works administrator for Spearfish. Capp said it’s the first code-approved gray water system of its kind in the country to allow kitchen sink water. Capp said it took four years of planning before they were able to get everything in place to build the house. “This is one of the most extreme examples of a code-approved natural building. This entire structure was all engineered and we went through all those hoops, all the engineer designs, all the stamps, all the review processes and the red tape and things like that,” he said. Capp said he did all of that to make it easier for the next people who want to include sustainable living elements in their home. “He's so open minded and so thorough with what he proposes," Johnson said. "You’re dealing with a multitude of ideas and he can back those up with the engineering. He’s one of those guys who wants to do it right." The Capps started construction on the house in June 2013 and got the structure standing and the roof on in 12 days. Capp is a contractor by trade; he owns and operates Pangea Design, a construction company specializing in natural buildings and permaculture landscaping design, but he also does conventional building and remodeling. So the couple work on their house when they can, mostly on nights and weekends. They are currently living in an old farmhouse on the property that Capp said is not energy efficient. They will move in to the straw bale house when it's finished, tear down the farmhouse and build another, slightly bigger, natural home on the farmhouse's foundation. The smaller house will then be a mother-in-law's quarters or guesthouse. They are eager to show off the new house and share their knowledge and experiences living in a more environmentally responsible way. “There are a lot of misconceptions about living off the grid. I mean, I have WiFi, Netflix and Hulu like the rest of you guys. I don’t live with one light bulb over a table and eat porridge, you know. And that’s a lot of what people think when they think of off-grid,” Capp said. “You can still have nice things and you can live very, very comfortably, if not more comfortably. "(This house) is totally obtainable. It’s obtainable without a bank, in some cases. That was my hope in all the designs that I have; they are open source. I don’t want money for my plans, I don’t want money for my gray-water stuff, I just want people to build healthy houses, safe houses, and use local resources." The Capps expect to have the house finished this summer and will hold an open house. And, when it’s done, no amount of huffing and puffing will bring it down. “We designed this house to last 300 years. A long time ago, that’s what they did. A grandfather built a barn so that three generations later, his grandson could still have livestock in it," he said. And his project is getting an enthusiastic response. “He’s a very energetic young man (who) has a lot of goals in his life and he’s going to succeed, I’m sure of it,” Paisley said. NEED LAWN maintenance? Garden tilling, mowing, weed eating, and edging.